Ross Stores, Inc. is an S&P 500, Fortune 500, and Nasdaq 100 (ROST) company headquartered in Dublin, California, with fiscal 2018 revenues of $15.0 billion. The Company operates Ross Dress for Less® (“Ross”), the largest off-price apparel and home fashion chain in the United States with 1,480 locations in 38 states, the District of Columbia, and Guam at fiscal 2018 year end. 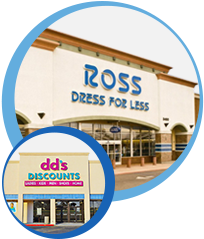 Ross offers first-quality, in-season, name brand and designer apparel, accessories, footwear, and home fashions for the entire family at savings of 20% to 60% off department and specialty store regular prices every day. The Company also operates 237 dd’s DISCOUNTS® in 18 states at the end of fiscal 2018 that feature a more moderately-priced assortment of first-quality, in-season, name brand apparel, accessories, footwear, and home fashions for the entire family at savings of 20% to 70% off moderate department and discount store regular prices every day. Additional information is available at www.rossstores.com.